Do you want to diversify a simple solid color or gradient background - add a "light" texture that will not be glaring and sharply contrasting, but at the same time, complicate, and ennoble the background. 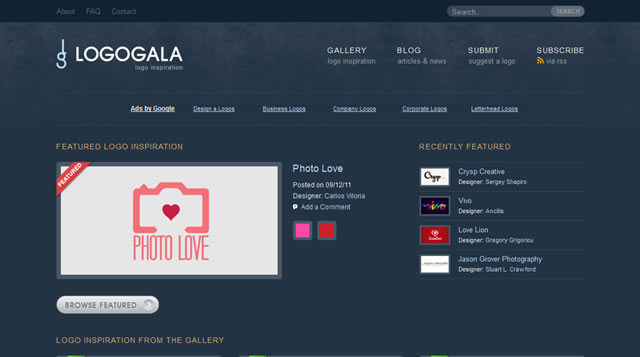 It will also highlight some certain sites, attracting the attention of the user. 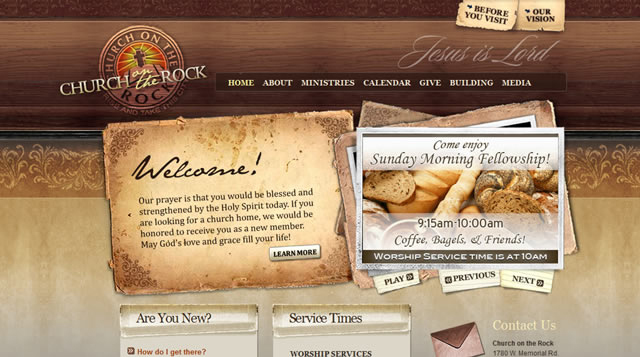 An example of the use of textures in this way can serve as a site LogoGalas. The site uses different variations of the blue color as the background and fonts, a dark band above the background with the menu and the search for the rest of the pages lighter. Pay attention to the barely discernible texture in the upper part of the site (where is the logo and top navigation).An excellent example of skillful work with textures! This helps make the transition between the shades of the background more visible and "interesting". 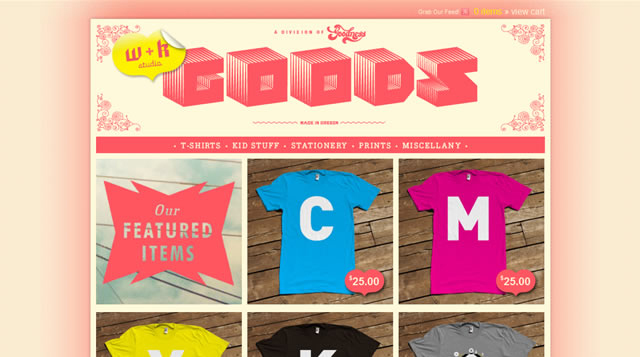 Another example - the site of W + K Studio. This texture is used in conjunction with the effect of the gradient for the background. And in this case "easy" and a very simple texture adds depth and "wealth" this very gradient background. Texture as a "brute force"
In contrast to "thin" a delicate texture that gently adds detail, work well sometimes bright, contrasting textures, giving the basic tone and mood of the song. Most often, these textures in web design used to select the header or add a contrast between the different columns of content on the site. Must be quite accurately refers to the "heavy" texture, as they may distract the user from the content page and draw over all the attention that is not good. A striking example of a second embodiment of the use of textures - site of Church on the Rock, where "strong" texture used widely enough. In fact, the entire design (especially in its upper part) Church on the Rock «involved» in the contrasting textures and their interaction: some areas of the site allocated in different textures, as you scroll down you have a conventional one-color background. 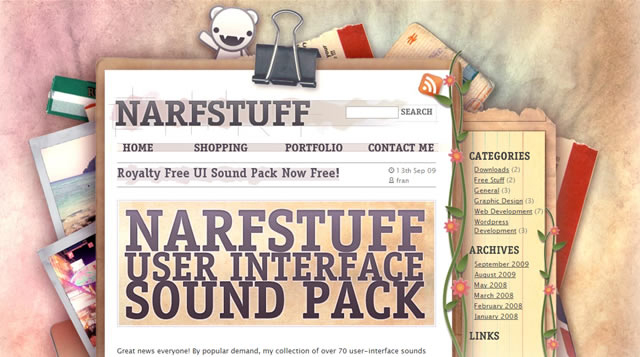 No less significant is the site design Narfstuff, where the texture of the background represents the brightest spot.On top in the header is used a lot of different elements and techniques of web design, texture, while some isolated areas of the page. If you scroll down through the smooth texture of the blur goes to white - good reception of the change to a completely saturated cap "minimalist continued" at the bottom of the web page. In general, if we talk about the texture in web design, it is very interesting and useful item, it can be achieved quite remarkable results. Personally, I love to add different kinds of textures for blogs because it helps the pattern look more succinctly, effectively, and highlights the main contents of the site. By the way, I advise you to look an article about the original generators backgrounds (Background) - find a couple of useful online services by which you can create a nice texture for the background of a web page. In general, the texture can be achieved using a very different result. Ultimately, all that defines the goal you are pursuing, but there is always a suitable texture! PS The site Crib blogger you can find an article on how to set the background for the site in html , and many other publications on the design, layout to help novice users. Bought a new trendy and expensive device? Immediately advise you to buy a cover for ipad 2 , or else your plate that just will continue his life. broken washing machine? - It is better to book a professional repair of washing machines for those who understands that in order not to get in the near future, the new breakdown.